They haven’t been on head to head every week since starting, and there have been some differences in Adelaide screenings due to football, but technically its the first time BB rated higher than ABB. Backyard blitz bet australias best backyards.. how many times has that happened this australias best backyards launched david? Interesting.. I expected the King to do heaps better than it did. Definitely an excellent result for seven. How did the office go? Lee, you my find it hard to believe…I only find it hard to believe they weren’t higher! Given the ‘quality’ of the others on that list! On Aug 19 it was 529,000 ep 1 and 347,000 ep 2 causing TEN to then pull it. What were the ratings for The Wedge? Interested to know whether it slipped again. These are national figures…. Seven’s movie let them down. 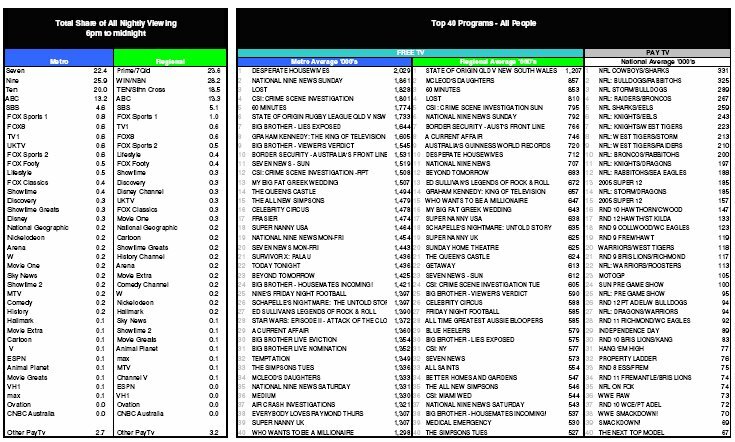 how is it possible that 7 had more shows in the top 2 and more with huge viewers (kath and kim) yet 7 bet it overall by a large margin? I find it difficult to beleive that 13 and 15 were in the top 15 shows. I love how the ABC is beating Channel 10 at the moment. How come Channel 9 won the nights ratings when Channel 7 had 5 of the top 10 shows?..was this figure Australia wide or Melbourne?